Thanksgiving Week signals the start of two important processes in the world of the Division I Football Championship Subdivision. The Saturday immediately following Thanksgiving is reserved for NCAA DI FCS first round playoff matchups, kicking off the 24-team championship tournament also known as the #RoadToFrisco. 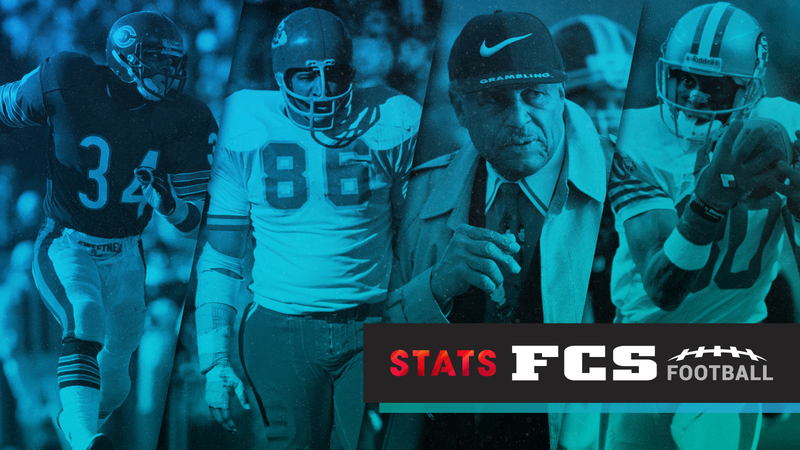 Earlier in the week, STATS Inc opens the annual voting for its FCS legacy awards. Entering its 30th season, the FCS legacy awards program continues to celebrate the high quality of play in the Football Championship Subdivision as well as some of the sport’s most-recognizable historical figures. The recipients of four major awards — the STATS FCS Walter Payton Award (FCS offensive player of the year), STATS FCS Buck Buchanan Award (FCS defensive player of the year), STATS FCS Jerry Rice Award (FCS freshman player of the year) and STATS FCS Eddie Robinson Award (FCS coach of the year) — will be chosen by a voting panel that consists of sports information and media relations directors, broadcasters, writers and other dignitaries. The Northeast Conference has a combined seven finalists for the four honors, marking the NEC’s largest presence ever in the awards program. All four awards and the STATS FCS Doris Robinson Scholar-Athlete of the Year will be celebrated at the STATS FCS Awards Banquet and Presentation, scheduled for Jan. 6 in Frisco, Texas, on the eve of the national championship game. Check out the NEC’s candidates below along with lists of national finalists for each award. Chris Villarrial, Saint Francis – The Red Flash didn’t have a winning record in their Division I history until the last two seasons, and Villarrial made it a first Northeast Conference title and FCS playoff bid this year. Records: 7-4, 5-1 NEC. The Northeast Conference handed out its five major individual football honors on Thanksgiving Eve. Playoff-bound Saint Francis saw sophomore Kamron Lewis become only the second receiver ever to capture the NEC Offensive Player of the Year award while head coach Chris Villarrial bagged his second consecutive NEC Coach of the Year honor. NEC co-champion Duquesne earned two top honors. Linebacker Christian Kuntz, the league’s all-time sacks leader, made it back-to-back NEC Defensive Player of the Year awards while freshman ball carrier AJ Hines ran his way to the NEC Offensive Rookie of the Year award (first Duke ever to win the honor). Robert Morris freshman linebacker Gee Stanley’s pass rushing prowess resulted in the NEC Defensive Rookie of the Week award. Read more about the #NECelite announcement by visiting the league’s official website. QB Zach Drayer (center) and the Flash will face a CAA team for the third time this season. It’s a NCAA Division I FCS Keystone State clash. Saint Francis will make its first-ever NCAA Division I FCS playoffs appearance at CAA member Villanova on Saturday, November 26 at 2:00 pm ET. Having earned a shared of the Northeast Conference crown for the first time in program history, the Red Flash learned of their first round postseason matchup when the NCAA unveiled its 24-team championship bracket during Sunday morning’s selection show on ESPNU. SFU clinched the NEC’s automatic FCS postseason berth when it moved to 5-0 in conference play by posting a 31-21 win over Central Connecticut in Week 11. Duquesne’s 5-1 league record earned the Dukes a share of the NEC crown for the fourth time since 2011, but Saint Francis secured the conference’s automatic postseason berth due to its last-minute 14-10 victory in this year’s head-to-head meeting on October 21. 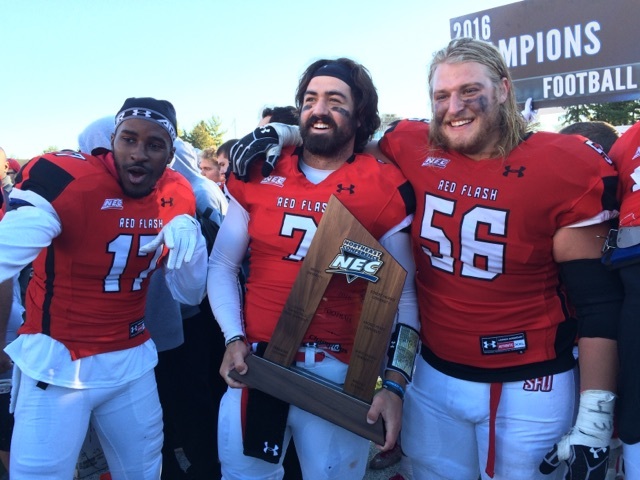 Chris Villarrial’s Red Flash are the sixth different recipient of the NEC’s auto bid since 2010. 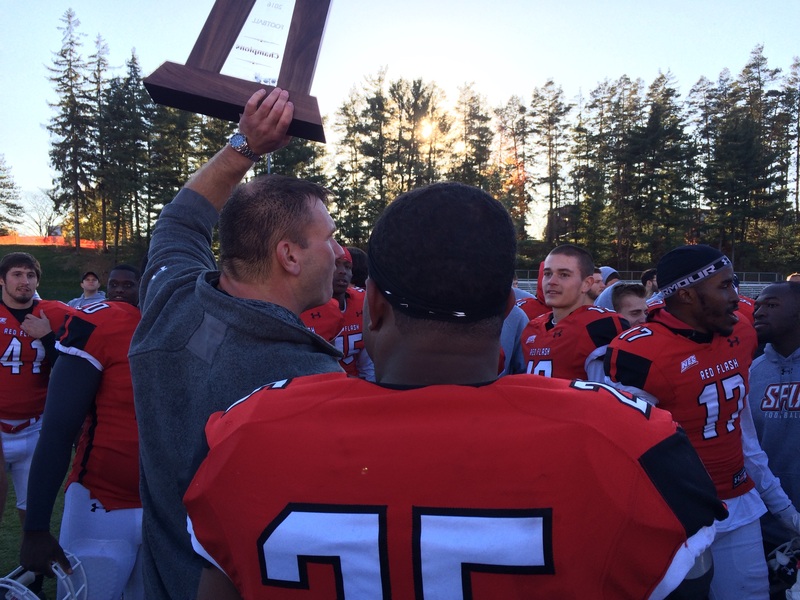 Only Sacred Heart (2013, 2014) has represented the NEC in the FCS playoffs on two separate occasions. Saint Francis’ meeting with Villanova will mark the Flash’s third contest against a CAA member this season. As a result, SFU and Nova have faced two common opponents this season. The Red Flash fell to both Towson and Albany on the road while the Wildcats defeated both teams at home. SFU finds itself bound for the playoffs after enduring a grueling four-game season-opening stretch. The Red Flash were only one of two FCS teams to play their first four games on the road this year and faced tough competition while doing so (two vs. CAA, one vs. Big Sky). Saint Francis held second-half leads in road games at Montana, Albany and Towson, but was unable to close out a victory on any of the three occasions. SFU, however, has played well with the lead during conference play. Four of the Flash’s five league wins have come by double-digit margins. The Flash erased their 1-3 season start by reeling off six consecutive wins for the first time in the program’s FCS history, which dates back to 1992, before falling at Wagner in the regular season finale. They have combined for 16,039 passing yards and 172 total touchdowns. On Saturday, they’ll oppose one another at Campus Field in the featured #NECFB on ESPN3 Game of the Week. Sacred Heart’s RJ Noel and Bryant’s Dalton Easton will close out their illustrious careers as two of the NEC’s all-time greats. Noel, a two-time NEC champion, will graduate as the league’s all-time leader in total offense (10,885 yards). The three-time all-NEC first team selection has the second-most passing yards (8,962) in NEC history and has been responsible for 103 touchdowns (81 pass, 22 rush) as a four-year starter. The 6-foot-2 Noel stands one touchdown pass shy of former SHU quarterback Dale Fink’s NEC career record (82). Easton, who is in his third year as Bryant’s starter after transferring from Akron, has thrown his way onto a pair of NEC Top 10 lists this fall. The Floridian (7,077) enters Week 12 within 145 yards of sixth place in NEC history, which is currently occupied by former RMU great Tim Levcik. Easton has thrown 66 career touchdown passes, including a league-leading 24 this season, and ranks fifth on the NEC’s all-time list. Sacred Heart and Bryant will kick off at 12:00 pm ET on November 19. Paul Dottino (play-by-play) and Kevin Gilbride (color) will have the call with John Schmeelk on the sidelines. The last time these two teams met at Campus Field, Sacred Heart clinched the 2014 NEC crown with a 14-7 victory. Noel and the aforementioned Levick are the only two players in league history to garner three all-NEC first team selections at the quarterback position. They aren’t your father’s Red Flash! Fresh off the 31-21 victory that clinched the program’s first-ever Division I FCS playoff bid, Saint Francis has cracked the STATS FCS Top 25 Media Poll for the first time in history.